Many of you know how skewed the media can be. This reporter (Alexa Liacko) was a true journalist and covered the story with integrity. To view the KGUN9 Road rage avoidance segment....from Tucson click below. To watch the clip Phoenix reporter Megan Thompson did on our team click here. Beginner Krav Maga "Street Fight Class" warm up at Combat F.I.T. Intermediate Krav Maga "Multiple Attacker Drills"
Advanced Krav Maga "Gun Disarm and Tactical Use"
David G. -Associate Professor of Judaic Studies University of Arizona "I wanted to thank you for working with the Jewish community and teaching its young people about our own self-defense system and philosophy, which is a pillar of Zionism. I took a Krav Maga beginners' class with you several years ago at the JCC, and can attest to your tremendous skill as a humane and effective instructor--no macho crap; just a model of how to carry oneself and approach life with dignity..."
J.C.- US Army Government Contractor "Hello Bruce...I will be deploying earlier than expected..... Your instruction has made the training very remarkable and realistic which better prepares a person. Thank you and hopefully I will be back when my contract is over." David- DHS Southwest Division "Your instruction and guidance over the past few years has been the greatest payback and investment in personal safety that I couldve asked for. All of the Krav Maga training you have provided, greatly compliments the training that I have had over the years in my career. Your delivery and IKMs approach to reality based training matches up to the real life circumstances that I have encountered and forecast the potential ones that I may encounter in the future. Thank you for your continued service to the community!" Will- Raytheon Contractor, Tucson "...training with you here at Combat Fit is like training in the Gaza strip, not a strip mall...the scenarios are violent, realistic... scary but I appreciate it." William-UAPD, Tucson " The gun disarming and retention seminar was very informative and realistic. I felt it helped me overcome the challenges I had with my speed in performing combatives after a disarm. This is unlike any other course out there. I truly recommend this to anyone facing dangerous situations on a daily basis. This is a Great class!" Dara- International Red Cross Representative "I was very humbled during the 'Car Jacking Prevention' Seminar I attended this weekend. The prep-training before hand was very in depth. Bruce, your expertise is clearly evident and impressive. Your no "PC" approach is refreshing and appreciated. It played out very well during the actual car jacking scenarios...so much so, that it felt eerily realistic. I will recommend 'Combat Fits' CQC and Krav Maga courses and seminars.....telling them that any knowledge gained through them can save their life! Thank you Madrihk for inspiring me and for the education that I will take with me after grad school around the world." Why do you ask prospective students to attend a krav foundations class and submit a training (character) application.... that seems too extreme? We are extreme... and we require these... because number one 'we do not know you' and number two, 'we select' who we train. The persons level of humility and patience are evident throughout the whole entry process...these become a clear indication of what type of student they would be and more importantly shows a glimpse of their character. It is a process that has been in place with our team for years and we have weeded out: a few sketchy characters, multiple immature-entitled individuals, two 19 year olds needing training before going to prison and one lady with a very violent past. We do this and will continue to this, out of respect and safety for our students and the integrity of Krav Maga. Combat FIT is different in many ways.....we will not accept some random person walking in with a coupon or credit card... we 'are' extreme....and you do have other training choices. Is your school different from the others... Yes...we are an instructional group using a multifaceted training facility... not a school, studio or dojo. I've heard that your school trains outside a lot, is that true ! ? Oh YES we do...our instructors follow the military style Israeli Krav Maga training protocols..... training 50% of the time outside, in the elements... in low-lite, hot or cold conditions. Its not pretty, but its real. If you prefer a padded floor and cool air-conditioning we'd recommend the others... both nice studios run by Kev and Jess. I've also heard that the staff is kinda rough and coarse...as a young woman it sounds scary...It is true? We avoid coddling students....we are non-PC and tell it straight up how it is. This training program is not for everyone...our staff is not for everyone. We take the training very seriously, we are extremely supportive yet avoid creating an environment in which everyone gets a T-shirt for just showing up. The reality of violence is scary....we are here to train humble men, women and teens to foster that inner warrior to face fear head on...facilitating their transformation from sheep to guard dog...that is our duty. Are your Krav Maga classes mostly designed to be cardio oriented, like for people looking to lose weight or those looking to get an intense workout? No. Our classes follow Israeli Krav Maga's tactical combat: teaching, training and testing methodology. While we have had students tone up and lose weight in our classes, our focus has been and will always be to provide the best Personal Protection Instruction, Education and Training to our students... just as Grandmaster Imi had envisioned. Now, if you are looking to lose weight, then we highly recommend that you talk to the 'CrossFit Trainers' who share our training space. They are by far the true experts in nutritional guidance and weight loss support! I am hesitant in taking such an intense krav maga program, can I come in and watch a class? Yes . A few of our current students were hesitant as well. Most said they would look at our basic website, scan the class schedule, ponder on taking the foundations seminar and finally pulled the 'trigger' and made the call to our office. A few even came by and watched the class. So yes....come by, but please call us 3 days before you plan on visiting. 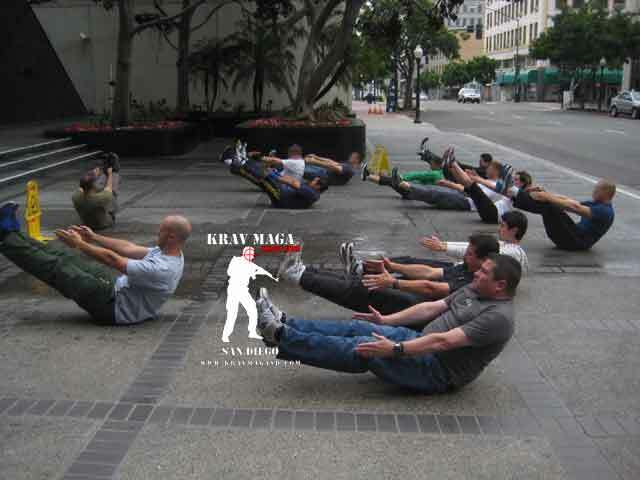 You are encouraged to watch a Practitioner Level 1 Krav Maga class. Be advised that some of our training sessions occur outside and involve some strong crude language. Please call us during our office hours to let us know when you plan on stopping by. I have never taken self defense before, can I still participate in your Krav Maga course...how much is it and what do I need to bring? You 'may' be eligible for training. You will first need to pass our CFC screening/character evaluation. Request the required "assessment" via phone or email and submit it 7 days before the foundations session. If you are approved for training you will be contacted referencing attendance in the mandatory foundations seminar. Items to bring: a water bottle, sweat towel, sneakers and an expendable shirt/pants. Also, bringing a high level of humility, respect and discipline is highly advised. For detailed entry and cost details click here. I'm looking for a self defense class that is realistic, not watered down... or full of aggressive and competative based people. What type of students do get in your classes...and how do you balance the two? Our students range from 23 year old University of Arizona grad students, to young professional business women, to middle aged federal law enforcement officers, to senior engineers and school administrators. Since we always conduct initial background checks and continually assess our students, those that are arrogant, overly ambitious and aggressive are always filtered out. Since our reality based programs are intense in nature and the techniques taught can be lethal, we always look out for the welfare of our students by having safety and security come first. Do yall use belts or shirt colors in KRAV to show what level a student is in? No we do not.... our students individual skill set dictates their level of experience .....I am looking at moving up in the belt levels quickly ....whats the typical time frame to do this? Our focus is and will continue to be, skill set development, not title achievement. True progression in IKM, or any RBSD system takes time...it can be upto 12 months or more. You have choices... and training options(schools/studios/companies/instructors) in Tucson....if all you seek is a belt, I highly recommend looking elsewhere. Have you trained under Sam Sade? I hope so, because I did when I lived in St. Louis and since moving here I wasn't very impressed by ....... at that other Krav School here in Tucson? Yes I have. Sam was one of my Krav Maga InstructorTrainers when I was certified to instruct back in 2002. I understand your frustration in finding other truly qualified, certified, skilled and experienced Israeli Krav Maga Instructors whenever you leave a certain city, school or instructor you like. In my early years I had great influential Martial Art Instructors like Mitch Awana, Sal Mandujano & Alan Dankwerth, that have moved on. But lucky in the past years I have found outstanding Krav Maga Instructor Trainers such as Dan Kaplan, Tsahi Shemesh, John Whitman and Steve Spoth, true professionals that have contributed greatly to my continued education and further development as an Instructor in Israeli Style Krav Maga. As for your disappointing experience, thats unfortunate. 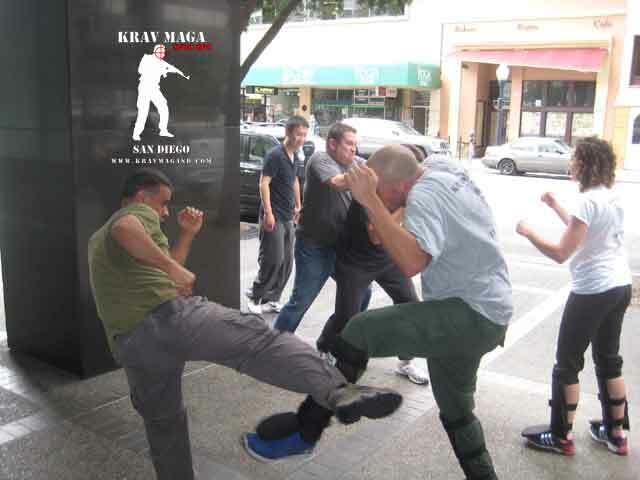 But keep in mind that Training Affiliations, Instructor Lineage, Certifications or Belt rank are meaningless if the instructors experience in "Krav Maga", their skill level, respect for the art, personal humility, teaching enthusiasm and instructional talent are not readily apparent upon your interactions with them. Come by our training facilitity and see if our instructors measure up to this criteria. Are you teaching at the SRC at the UA..... will you be teaching any Krav Maga classes on campus? Yes, we will be teaching on campus along with a 8 week course at the rec center. Click here for details on the class our chief instructor runs for students at the UA. To watch a video clip a UA student made click here. From 2001 to 2010 we ran Krav Maga classes at the rec but cut ties once the fitness staff was taken over by two incompetent individuals, Lorey Pro and Mark Z. They were both terminated 2013. As of August 2013 the rec center has had a "fitness focused Krav" course taught by a nice young lady. We were contracted by the new professional staff to teach a reality based course and returned in 2014. I served in the Israeli Army years ago, was trained in basic Krav Maga and was concerned that this great combat art is now being taught to everyone and just becoming a commercial product in America. Do you actually just teach anyone? No, we do not just teach anyone. We have turned down many contracts, denied entry to potential students and dismissed those that didn't adhere to our policies and Grandmaster Imi's Behavioral Code Pillars. As you may remember from your service and time in the IDF, Imi's code stressed: humility, good citizenship, safety awareness, self control, patience, respect and most importantly integrity. This is exactly what we here at CFC expect from those interested in attaining or maintaining the title "Krav Maga Practitioner". Why your Krav Maga classes are run in sessions, why aren't they on-going? Our Israeli Krav Maga (IKM) courses are on-going. The IKM program is run in sessions of 6 or 8 weeks, in order to maintain the integrity of the curriculum and the quality of students. During transitional (probationary and recovery) periods, students are evaluated and if they adhere to Imi's code, are then allowed to continue into the next session. In essence the classes are on-going for those that adhere to the code and our policies. Breaks in training are always emphasized in the Combat Arts. Since our focus is practical reality based self defense training through rigourous combat conditioning, even the most dedicated Krav Maga Practitioner appreciates and understands this training concept of transition and recovery. My child has recently been bullied at school, what programs do you provide that can help them without scaring them? The radKIDS safety course is an exceptional personal empowerment program that has benefited over 160 kids here in Tucson alone. Its a nationally recognized program developed for children between the ages of 5 to 12 years old. It covers many topics to include bullying and how to deal appropriately with such individuals. It is taught by highly skilled and patient instructors that understand the trauma involved with bullying. Click on our specialized courses tab to learn more about this great program. For teenagers (13-19) facing bullying we provide advance level training through our Teen program. My son is 16 and very interested in joining the military. I was wondering if you allowed teenagers in your Krav Maga classes? Generally No. On rare occasions teenagers (16-17) that have demonstrated a high caliber of maturity and respect, have been allowed to participate in beginner Krav Maga classes...that with the parentsl/guardians participating in the classes as well. The Chief CFC instructor will make the final decision of participation, after meeting with you and your son. As for your sons interest in the military we would recommend our new teen leadership program.. Email us to obtain details on our next session. I'm interested in organizing a class for my daughter and her teenage friends. Do you offer private instruction for groups and/or individuals? Yes we provide private instruction for both, groups and individuals. We can discuss and formulate a lesson plan according to what you would like covered in your scheduled self defense classes. Typically when we train teenagers we provide an educational environment that is disciplined, safe, realistic, informative...yet full of fun. Private one to one instruction is also available. Group and private rates depend on the amount of time needed and the amount of students participating. All of these lessons can be scheduled for the weekdays, weeknights or weekends at a safe location that is convenient to you. Does your team provide special training relating to workplace violence prevention and mass shooting response? As a Manager I would like to protect my people...who are like my family. Yes we do provide specialized sessions focusing on mass shooting response and workplace violence. We have various lesson plans that focus on recognizing potential violent individuals in the workplace, school, and public venues. When training select groups we note that most individuals in our classes may have never had self defense training before and we prepare them accordingly. We slowly condition these folks to deal with potential violent situations by using team building exercises that incorporate various personal protection techniques and survival tactics. We appreciate your initiative in keeping your 'Work Family' safe! I am a night supervisor at a shelter where we provide services to travelers. We have had incidents where my staff has been threatened and harassed by certain unruly individuals. Do you at CFC provide on-site self defense classes for staff training's? Yes we do. We provide group, company and corporate personal protection sessions. In the past we have conducted staff training sessions for those working in hospitals, medical centers, women's shelters, armed security firms as well as middle schools. Media outlets seeking an interview: If you are a media outlet looking to cover any of our training programs on your local newscast or radio station, then please follow the below protocol. 1. Email or call during our office hours to discuss your angle or focus of coverage. 2. Submit your questions ahead of scheduled interview for our review. 3. Await confirmation of acceptance of questions. 4. Schedule interview time and day at our convenience. 5. When on-site stay within pre-selected area, time frame and focus of coverage. 6. Notice that all photos, videos or images on this website are property of CFC®. If any of the above is not adhered to, we will discontinue our correspondence. If you abide and always follow the "codes of journalistic standards and ethics " then we are good to go in talking to you. Otherwise go elsewhere. En Español Clases de Defensa Personal en Tucson: Nuestro equipo de Instructores en CFC Tucson, estamos listos para ajudarles a familias y grupos de 4 o mas personas, en aprender las tacticas basicas de defensa personal para sobrevivir cualquier ataque. Para informacion sobre precios y para organizar una clase de una or dos horas, haganos el favor de llamar a nuestra ofician 396-4864.